A new year always comes with more responsibilities. It’s easy for us humans to take a break when responsibilities get stressful, but your lawn will keep pushing until it can’t. In order to lend a helping hand to your lawn, you’ll have to learn about various lawn care service opportunities, when they take place, and what they mean. During the growing season, your lawn uses up all the nutrients found in the soil, and unfortunately, the nutrients will not automatically replenish themselves. That’s why your lawn needs fertilizer, weed control, lime application, aeration and many other services throughout the year. But who has the time or energy to manage these items when you’re busy working on your New Year’s Resolutions? To be the envy of the neighborhood, you need to give your lawn the care it deserves. That means sticking to the right mowing schedule, picking up leaves in the fall so your lawn can breathe and stay dry, introducing the proper nutrients at the right time (fertilization), preventing and killing weeds (pre/post-emergent), maintaining the correct pH balance for your soil (lime soil conditioning), and unpacking your lawn’s soil for easy breathing (aeration). 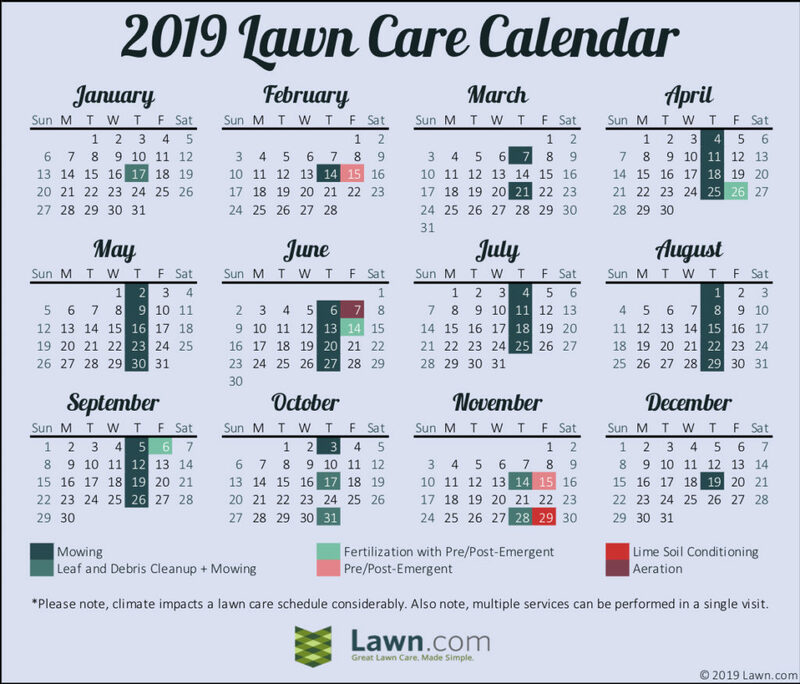 For the best lawn that stays green as easily as you make and break resolutions, we’re sharing our Lawn.com calendar to help you help your lawn. We know that a lawn needs care all year-round, and we know that you work hard during the week so you don’t have to work on your lawn over the weekend. That’s why we came up with Lawn365 – a year-round solution to all your lawn’s needs. Lawn365 comes with three levels of plans: Thrive, Shine, and Essentials. Each one is crafted to cater to your lawn’s needs and your needs. The Thrive Plan helps your lawn…thrive. It has all the service offerings your lawn craves: mowing, leaf and debris cleanup, fertilization, weed control, lime conditioning, and aeration. It keeps up with your lawn’s momentum throughout the year: as summer beats your lawn down, Lawn365 Thrive Plan returns nutrients to keep your lawn going. It helps make the most of our fertilizer by balancing your soil’s pH with a lime application as well. It’s all tied neatly together with an aeration service to help unpack your lawn’s soil and let it breathe. With Thrive, we worry about your lawn’s schedule for you. Shine comes with mowing, leaf and debris cleanups, and it keeps your lawn boosted with fertilizer and weed control visits. Throughout the year, we’ll mow your lawn, clean up leaves in the fall, and strategically fertilize and manage your weeds. We monitor the climate and pick the three optimal times of the year to nourish your lawn: Late winter, spring, and fall. This plan is perfect for a lawn that needs a little extra TLC. Essentials offers your basic mowing service: Mow, blow, and edge, plus leaf and debris cleanup in the fall. If there is any extra work your lawn needs outside of the growing season, it is a leaf cleanup! Read a little bit about why here. In the fall, when your lawn starts to go dormant, we come out less often and alter the scope of our work to handle all the leaves that fall from around the neighborhood. It’s the least we can do for your lawn to allow it to breathe easily and stay fungus-free until spring. The best part of these plans? While the rates between plans differ, each service visit within the plan costs the same, no matter which services you’re receiving on a particular visit. That means you pay the same price on a fertilization and mowing visit as you do on just a mowing visit. There are so many things your lawn needs throughout the year to stay vibrant. It’s unnecessary to stress out about your lawn with a program like Lawn365. Focus on your resolutions, we’ll focus on your lawn.